The “yin” and “yang” flows to and fro throughout lives providing the sewn. And when it’s all over and taking your bows, karma presents you with a kick in your arse. It says, “try it again, young soul of earth. Sleep well tonight and think of the dirt. Supplying the manufacturer with a path to create. Now onwards laddies into the matrix and plights. The Fibonacci grew all over the edges and it created electromagnetic energies that communicates with the entire universes and supplies energies needed. It seems to me that our universes make up the upper lobe of a lung or perhaps I misinterpreted the idea. It seems right. My life changed in February 2019. There is no turning back. All my beliefs changed as my experience showed life in its reality and whom god is to mankind. What tomorrow brings to you or me is unknown but something will happen and we are unaware until that force occurs. The most important lesson learned in February 2019 is love. God is love and nothing more. It doesn’t judge or criticize you or me. It doesn’t sit on a throne in heaven but can be found in the cells of all things whether living or not. So tomorrow pick a wildflower and look into its living force and when you peer know the divinity that you see. When you look at a stray dog or cat, know that you are watching the cells of god moving in our lives. Look at the truths surrounding you and leave behind any false dogmas. Know that heaven is not anything like earth and nothing resembles the stories that mankind has uttered for thousands of years. Nothing. Please understand that poetry writing is difficult for me since my incident last month. Anoxia has robbed my memory though every day I am getting better. Writing poetry makes me think. I don’t want to write any, but it’s a great exercise for my memory. Can’t someone assist, can’t they see me, geez! Time has flown by and there’s nothing I have achieved, for me. Compliments come in for my nothings, I’ve truly deemed. Rolling my eyes about living and it’s all a confusing dream. So February comes and it’s cold outside. Loosing breath one night fighting hands that slide. No memory of children, pets or my homely mess. In a place of intriguing beauty and experience. At Pleiades, then Orion’s Belt, up and away from there. And I thank him for all that he is blessing me. To the voices calling me home that afternoon. Death is individual created for all of us as heaven is, as well. It is my opinion and not based on fact, the harder the death, the more someone loved their life and didn’t want to leave Earth. So, this is why I say, death is created for each individual to have them leave their bodies. In my case, death was hard. It was though, I was being strangled and death was frightening until I collapsed into nothing. There were no memories of that time. Maybe 20-30 minutes. When I awakened 2 days later in icu, I was in and out of a coma. It was when the oxygen and time returned that I began to remember or see heaven then. Heaven is created for each individual as I said. That’s why some people have deeply religious experiences and others have their hearts or beliefs experiences. My love in life has been creation of The Earth, the galaxies, aliens and supernatural beings, relics, ancient cultures, mankind’s origins and mathematical physics, patterns and anything oddly different and interesting. In the past (late 1990’s) I had been a “born again Christian” and got rid of all the things that I loved, mentioned above. After the late 90’s after leaving the church, I found and followed fearfully my own beliefs. I found out during my recent death experience that God (small word for the creator) loved me just as I am. In heaven he/she showed me everything that I love. I found out that I am okay where I am at with the creator. So I hope that I answered your questions. Thank you for sharing your thoughts. I so much appreciated reading 📖 the words written. Thank you, I hope that I have helped. Yes, I died. I flatlined. I had no pulse and no breath. My son called EMS and my daughter got to my house before EMS. That being said, I went without oxygen for a while and when you read my post here on WordPress, it might be confusing as my brain was/is anoxic. So I will post some of my experiences in heaven. I looked at all the thousands of brains in the pool. There was no memory of loosing my bad thoughts. There was no pain. I think that I went often there to the pool within my journey to heaven. Suddenly I am brought to look at The Earth. The dirt was shown at a magnified distance. It got closer and closer. In the dirt I saw shiny brilliant objects. I saw atoms, protons, neutrons and shiny objects. Gold, silver and another universe held in quantum physics and very much alive. We moved on. I was with someone but I don’t know who. I didn’t ask but was comfortable. We went to the surface of Earth and saw all the relics, monuments, artifacts of Egypt, Per, Mexico and Sumerian. I was amazed. From Pinterest. I chose this as part of the Earth’s Fibonacci design. It’s very deep, very interesting and a bit scary. I think we went to the Cleansing Pool. Then I saw several non human beings. I understood. These were the gods. And nope! Off we went to the outer perimeter of the universe or universes. There is where I saw The Elohim (Hebrew for gods. Plural) creating the universe. My symbol for The Elohim. On the parameter of the universes there is a bundle like a baby bundle that holds us tightly together. It is charged with magnetic energies and it is made of The Fibonacci Code or designs. These designs are alive and growing rapidly. They wanted me to watch and they wanted me to see what they were making. I got these images from Pinterest and altered the colors some. Heaven has different colors and I cannot remember to show you what they are. I wish that I could remember. Mesmerizing indeed. I had to look away from the designs many times as it is all consummating and a bit scary as we’ve never seen anything like this on Earth. Here are some of the images from Pinterest. I wish that I could tell the artists who drew these how I think they are close to what I saw, though the colors are different. Okay one last very memorable experience I had while in the heavens. I saw binary codes. I don’t read the codes so I wondered why they showed me. But what I think they might mean is this. The codes have earths dates, and names of people. The gods, angels, supernatural beings or whatever they are can travel here to us at any date and time. The codes are used for time travel. Then recorded code information is folded onto each other just like when scientists say the universes bend together and traveling in the universes becomes a shorter distance. This is the same physical principle for binary codes and time traveling. Okay… thank you for baring with my writing if you read this. I appreciate your reading this. Questions are appreciated and I will get back to you as soon as I can. I had to share my note about this poem so that next year when FB asks if I remember writing this I can say, yes, that was the time in winter (cold for us in East Tx 2019)that our heat and air conditioning caught fire 🔥 and staying in my home because of my animals during the low temperatures was crazy! But, it was a huge learning experience. This poem reflects my thoughts in the middle of the 5 days of freezing 🥶… the last line reveals my anger towards God or Elohim one of our gods. You let him have its way, huh? You are the good one, right? Can you not be trusted? Stop it! Stop it now! For you are the father of our lights. You are the one song about throughout the land. Please, my hands are cold. Perspectives about how life works and occurs for humans and animals and living cells are different for all humans. Every person has a different concept of their belief system unless that dogma as been hammered into a soul over time, and presently governs that person. For example phrases in conversation like “Praise the Lord!” Or “Bless you,” and “I’ll pray for you,” are judged by the circle of the congregation of “Believers.” Also, the New Age Yoga word, “Namaste,” follows another type of believer who feels their need to express their beliefs and so that word, too, becomes a word meant for dogmatic control and protection from an offensive adversity. The point I am making is this: We become so easily swayed/manipulated because we desire and want rulership and/or governorship by a “King,” or a dogmatic belief that says we are accepted, loved and fit into the large scope of the kingdom of people. Is it possible to think outside these rules that govern the above and ask questions? Is it possible that we are driven to the place of DOGMA for a reason? Is it possible, now ask yourself “possible” that we are controlled by ideas, rules, thoughts, sayings, words, phrases, magnetic energies of one, that govern us in such away. It is from somewhere else our designated and herded lives and circumstances assigns to our lives rewards with wealth or poverty. We accept this as truth and do not cross over the lines drawn in the invisible sands in less we are atheist and believe that only we ourselves control the universe or our surroundings. We are afraid to ask this force or question the intentions of familiarity to a religion or political group or any ideology because of the fear of going to hell or dying a horrific death or being cast out of a society. I write this above because my story of events are based on the above dogmatic beliefs, fears and control. I want you to know that I serve a loving God who is supportive of me personally and is happy when I go beyond the lines drawn in invisible vague old rotten shells and sands. There seemed to be several points on this ufo. Maybe 5-6 and I was bare eyed without glasses on. The orange morning pics were on 11/15/16 and the night shots were 11/16/16. The 11/16/16 is where the round artifact flies around. I put some lenses on a couple of pics to clarify the size and density (if possible with a cell phone). My official copyright and number for my novel…. I received it yesterday and I filed for it in June of 2016. What I realize now, and will be of interest to you if your also writing a novel or books of poetry, is this fact. They, the copyright officials, go through every word and sentence that you’ve written to make certain that you didn’t plagiarize anyone else. So when you apply for a copyright, they will ask if you have quoted anyone or used any sources other than your own. In my case, I used The Bible, The Gnostic Gospels, The Book of Enoch, and Simon and Garfunkel lyrics (one line). So, I had to include any sources and cite them. Now, please understand, this process takes time, but it is inexpensive. My novel is roughly 140,000 words give or take a couple of thousand on either side. It costs $35.00. Not bad. I think a poem is around $7.00 and If you love some of your work and want t keep it your work, then please, go ahead and file for a copyright. For example, and I will use my dear friend Susan Joyner-Stumpf as an example. Lets say, Susan has her own copyright all over her work, but if she hasn’t officially filed for the rights, then I (and I wouldn’t do this), could copy and paste her work onto my own work and submit it to the copyright officers and Susan would have to sue me. That would take more money than the $7.00’s for her poem, had she just simply filed with the official copyright office. By the way, students search the net for work they can turn in as there own… They perhaps are the major culprits of thievery of un-copyrighted poetry and short stories… Yep… They’re trying to pass college English with an unsuspecting writer’s work…. Paper Rater has a free site to check your work. It also has a plagiarizer within the program. So, you can test your own work to see if you’ve plagiarized. It’s interesting also to check your older material that you put on the internet. The plagiarizer should bring up the original written work and perhaps a date and name… So, check your work to see if your published on the WWW…. is prohibited without the express written permission of the author. Look for “The Lives of Fairy Godmothers, Angels and Witches” on Facebook! seeking the answer to the child’s petition. It did not stop, until it found accountability. Or you may read it below. Even as an older woman, Catherine could not stop the determination of the inquiring storm – to find the answer to her childhood question. The mission of the wind was to solve that petition. A request by prayer was sent that day, long ago; and then I came riding in on the wind. Tadhg Harding enters the story, wearing a warm angelic smile and kilt. Tadhg recited the letter for Catherine. “Eleanor wrote it,” he added. Tadhg welcomes you to journey inside this story about a woman named Elizabeth Catherine Dubois: “Everyone needs help – the supernatural kind – right?” Well, this tale is about when, where, why and how angels, or fairy godmothers, answer prayers. as you settle in to a cozy chair and hear a story about the magic of love, the dignity of grace bestowed from God, and the power of deliverance from oppressive spirits on an older woman who was once her parents’ little fairy princess. Like so many older humans, Cat Dubois almost lost her happiness to ill-fated happenstances which couldn’t be avoided. The only difference between Cat and others who seem to dissipate by death in the vagueness of their pain and sorrow? The young girl cried out a prayer that found a way to God’s ears and heart. So, He responded; He sent Eleanor, who came riding in the wind. This story is about the struggle of life and the resolutions that come to Cat many, many years later; but nonetheless, answers come, just in time, in a magical way. So, allow me to introduce myself. My name is Tadhg Harding, and I’m the keeper of stories and poetry. That is the meaning of Tadhg, and this is what I do. I am both the story teller and an active participant in this tale, and I am also related to Eleanor, an oh-so integral character in this story. We are related by spiritual order and virtue. We travel through time, space and the world together. Come in, let us draw near. There is nothing to fear; this tale is an active adventure. Humans, at times, question the fairness of a loving god. Life can feel like a test of human endurance. Why are some people fortunate or “blessed,” while others ache with despair and tragedy? Why is the innocence in children’s beautiful faces often lost within hardships, over a lifetime? Why are some untouched by horrors and deep valleys of sorrow and hatred? Lastly, why are some on a non-ending roller coaster of frights and thrills? In order to understand and appreciate goodness, the darkness must be known, as it’s been taught many times before this story. Behold, the light of God shall shine upon the paths of danger, for our own good, and lead us, instead, to the way of enlightenment for our spirit’s development. We shall lie down in those green pastures, and there our souls will be restored. We will one day act like God. “Could it be in a different dimension or lifetime?”which, of course, is an age-old debate pontificated in sanctuaries and bars across a world of speculators from the righteous to the sinners. And, should we choose to accept the calling to a higher self, our assignment, or our journey into the syllabus He has prepared for each of us individually, must be eventually travelled. If so, it surely is then that we shall be like Him, and see Him, in the splendor of His love; because in human living, love, mercy and grace are the traits of the Father who has come down from the lights and resides in our souls. Unique, are we. Good and evil will be known, but few will defeat dragons in one’s lifetime. ”Dragons are real,” many will say, but I ask you, “Are they real today?” Are not dragons, real or imagined, just our conduits to godliness? For within the very best of us, and the very least of us masterpieces, lie imprisoned spirits which are trapped by the flesh of mankind, or Adam. Adam was from the dirt of this planet Earth. Adam nor his seed will not live forever. But the Spirit of God will survive forever; spirit is infinity. We are not. Then, there is the soul – the ego. The dual nature which longs for the earth or the “Adamic” nature. It begins innocently, then falls into God’s grace. The quest – our mission or lesson – is to defeat the opponent, the enemy of ourselves, our egos. So, this story is about defeating the challenger of God using the voices of the accuser. It is the strong one of this earth who whispers to the accepting Adamic humans all the reasons that failure is the final destiny. The devil within is conquered metaphorically in isolated forests; deep-flooding valleys; on rocky hillsides; in snake-filled pits; in vast oceans where a single lifeboat drifts eternally; in lonely, locked cells; in cold hospital rooms; in the loss of a child or loved one; in burning towers; crashing planes; bombshelled cities; in an orphaned child; in unwed mothers; in life-changing events; until kingdom comes. The devil is appointed an unending reserve of trials. become more and more like God. Our story begins now. It is the story of a woman’s journey from innocence, to enslavement, and then to freedom, within a lifetime. You might share the sorrow and pain of her battles, and relate to her innocence during childhood, which is magically experienced by Cat. Seemingly, you might experience and share her rejection from the fellowship of those with whom she grew up. You might feel her hurt, her loneliness, her isolation; and know her addictions as your own. And, just when you think there is no hope for her – or maybe even you – you may find yourself cheering because there is magic and goodness in a dark world. There are fairy godmothers, angels, and guides who do help us just when we need them the most. I welcome you into the story of Elizabeth Catherine Dubois. Now, Elizabeth Catherine Dubois, or “Cat”, as she prefers, lives in a lonely house in the Appalachian Mountains, in a place known as Glory Town. She is young; growing up is upon her. As you sip your tea, I will tell you all about it. Hers is a tale of loss, troubles, enchantments, delights and the magic of God’s angels, fairy godmothers and other divine interveners. These divine creatures – angels, guardians, fairy godmothers, or your choice of moniker for those who carry goodness on their wings – came to Glory Town for the sole purpose of restoring Cat Dubois. Now, Glory Town is nestled between two old mountains in The Appalachians, the picture-perfect quaint village of 11,000 residents, which is not quite as perfectly round a number as 12,000, but purposely maintained at approximately 11,000. Furthermore, the municipality is never allowed a population exceeding 12,000. This was written in the foundations of Glory Town’s “secret codes” and governed by the town’s three founders. These three are: David Finks, whose wife is Hannah Finks, with whom they have three sons, Warwick, Winston and Chad. Next in the hierarchy is Robert Fletcher-Snutgrass, with his wife, Jessica, and their four children: eldest daughter, Emily; middle son, Taylor; Claire, the next girl; and then, baby, Suzanne. The third family led by a founding father of Glory Town are the Thornton- Henchmens with their tribe: patriarch, Theodore or “Teddy”, for short, and Selma, his wife, and Hector, Molly and Thorpe Thornton-Henchmen. his wife Mary, and daughter Tammy; then are the Millers and their two infamous sons – Dillinger and Cooper. Finally, the immigrants from France and England are the Dubois family, comprising Philippe and Catherine Harrington-Dubois, and their daughter, Elizabeth Catherine, around whom this story revolves. “Joy to the world! The Lord has come.” The crowning attraction of Glory Town is its famous claim as THE Christmas town most photographed and visited by tourist families with the delighted eyes of imaginative children and their parents, who still wonder, like children themselves, at the warmth of the holy season. Glory Town enlivens their memories like a picturesque scene on a vintage postcard, assuredly giving Christmas lovers warm fuzzies. When approaching Glory Town from either mountain’s winding road, it appears like a Norman Rockwell painting that everyone wants, but only a few truly experience in a lifetime. White snow, white picket fences, gently billowing smoke from the home fireplaces burning warm, and sidewalks, along which passersby smile endearingly while wishing all “Merry Christmas!” signal the revelry. Carolers beckon from the sanctuary, donning red choir robes and halo-white satin collars, heralding the music of pleasant voices in perfect a cappella, lifting up Gregorian hymns as the gothic organ opens with Bach’s “Passacaglia in C Minor”. The Carolers, in a procession of holiday finery, continue their serenade to the corners in front of Victorian homes prominently, proudly, situated within what area, over many Christmases past, would become the town’s spiritual epicenter. “Hark! The herald angels sing, ‘Glory to the newborn king…’”. Everyone in Glory Town is expected to play roles demonstrating angelic behaviors at all times – and especially when guests are afoot. This whole town is a “Christian town”, hastening one back, in a heartbeat, to a Charles Dickens setting. Good behavior as far as one can see has been dreamed of, desired by, and lusted after, by those who have ever read or heard of the charm found only here, only now, this magical time of year. The reputation of this little whistle-stop snowballed, bigger with every winter. Glowing reviews, and enough money to publish and mail pamphlets far and wide, made the traditions of these townspeople turn into the regular place of pilgrimage it is today. When visiting Glory Town, no tourist expects anything less than perfection. Who wouldn’t want to make this place home? The improvements of puritanical whitewashing for the holiday productions begins each summer, with “summer” rehearsals starting directly after New Year’s. These practice runs include all residents – young and old – and require them to play their parts so well they’re second nature. By August, all the families congregate and begin re-teaching manners they’ve been teaching exactly as written and executed in the1800s. The women sew new costumes each year. They rehearse with their children so everyone is in step: how to act, how to talk and how to dress as if they still lived in the 1800s. Making money by entertaining tourists has always been a major source of income for the town. Aside from that revenue, each business is small – and there aren’t many – and their bottom lines are nil to nothing. They like it this way; that’s why the law exists that the town will grow no larger. No corporate world exists here – in yesteryear. Everyone depends on the gratuities offered; they come in all year long, now that even the tourists have been courted to remember tithing so the traditions can continue. Little other real employment is available in Glory Town. It has become so confusing that some townsfolk, especially the older ones, just stay in their assigned role all year, shifting from season to season, talking in a dialect privy to Glory Town from nearly two hundred years ago. As they grew into their roles, they became them…except for some of the women who serve on the community boards. They dress in their finest “other” attire most of the time. giving thanks that they are governed by strict Biblical standards. The town is theirs – God seems to have made it and them just the way they are. Surely, it is a blessing for their piety, the elders say. And, though they welcome the tourists who marvel at their magical village, they are happy when the visitors depart. They certainly appreciate the economical gratuities. They benefit from the applause of the audiences they entertain; however they do wallow in the esteem. Glory Town is exclusive to their chosen few. The tourists are the ones who now provide all the necessary income to maintain the town’s old architecture, the roads and the restorations to every utility, but the natives are very, very fussy about who comes to live, who seeks to stay, who stays too long after the stockings come down from the mantles. The visitors make them uncomfortable – way over their comfort level. The steeple of the old wooden white-framed church is first seen when driving down from the mountain roads. It seems to welcome all from the winding path. But looks are deceiving, and the whitewashed paint is just that – whitewashed. And the winding path, it’s the most winding in the minds of those who live in Glory Town. If anyone comes to visit outside the season of giving, the townsfolk know who they are, where they came from, what their intentions are…and when they should leave. The gossip trail is fierce; if one knows something new, they all do. the Catholics have the evenings, the Baptists take the 10:00 AM every Sunday, while the Methodists have the 11:10 AM slot, and the Episcopalians secure the earliest services at 8:00 AM sharp, ending promptly forty-five minutes later. The Presbyterians are at 9:00 AM, and the Pentecostals, which include the Assemblies of God and so forth, occupy most of Sunday afternoons. Church bells ring throughout the day, calling each congregation to their appointed time of wor- ship. The church bells sound rich and deep, reverberating with man’s spirit and soul, ringing to the heavens to be one with his Maker. However, when fellowship time comes, they congregate all denominations together, eating, singing, dancing and any socializing hoopla at the time. Otherwise, there wouldn’t be many fellows to the ship. Mountain clogging and square dancing are two celebrated happenings that many in Glory Town excitedly gather for during the fall and spring months. Their fiddlers and steel guitarists are some of the finest in the country. There is a young vocalist competition, and a clog dancer contest, which also includes a beauty event. These festivals bring in neighboring county folks. A good healthy county competition is exhilarating, and the town is always hoping for new talent who can bring celebrity status to the area, as well as keep the faithful tourists geared up for another visit. After all, the nearby state of Tennessee has quite a reputation for talented artists. Glory Town wants to reap some of that glory, too. Glory Town has one hotel with eleven rooms which, during Christmas, never has any vacancies; and the two private bed and breakfast facilities tend to be booked up an entire year, or even two, in advance. other venue for entertainment. The tourists resort to entertaining themselves, and they accept that for all the “unbelievable” goodness showered upon them the next day. The grocery store is a small market that transitions to an open-air fresh fruit and goat-swapping center during summer. Nearby are ruby and diamond mines that have shovels and sifters for rent in summer, too, but it doesn’t take many people on staff to run them, so, again, the job market for Glory Town is slim to none. The coal mines employ about 42 of the working class of Glory Town. Logging is protected, but where it is allowed some of the men of the town work in that capacity. There is a double-sided clinic that tends to people on one side, while a country veterinarian utilizes the other. If the regular doctor is incapacitated, the country vet works both sides. That vet has delivered babies of every breed and stitched up minor lacerations on both humans and animals. But, all victims of major incidents are flown by helicopter to the nearest open emergency room. The roads leading to and within Glory Town are treacherous during winter. Many people coming or going lose their lives trying to drive up or down the two-lane mountain roads. For safety’s sake, most of the grocery shopping is done in monthly installments, especially during the winters, and particularly if the individual lives on Downy Mountain Ridge Road leading into Glory Town. This road is where Cat Dubois lives. The majority of the residents were all born in Glory Town – almost every single family has been a part of this whole scenario since its founding, except the doctor and the veterinarian. But, eighty- some-odd years ago there had been just one other outsider who came to live among them – Cat’s late uncle, her mother’s oldest brother. Great Depression. Along with his wealth built in years when most are mere boys, Nicolle was almost idolized as “the” man’s man. He introduced the lush-hungry males of the town to tobacco and Bordeaux. With his keen mind for scientific advancements and business, and at only about twenty- three years old, the young industrialist offered to to help build the economy of Glory Town if he was allowed purchase of the estate. By all historical accounts, François had been the only newcomer who had ever been allowed to stay. When François met his untimely death in 1939, Cat’s mother and father came to assume responsibility for the manor, and began employing locals seeking work. The Depression lingered longer there in Glory Town. So, for the next fifty-one years, it became their home. After the death of her mother and father, twenty-five years gone now, Cat has lived there alone. She is 61, and her story must be told. Though, I’m as parched as the desert, and my skin is brown and wrinkled by the scorching sun, you have never left me. I have known you are my friend and will never let me wither. If the night had no light from the moon, if the ocean’s waves consumed the shores, and if I had no friends, you would always be by my side. You would lead me with your sweet tender voice, you would send angels to hold my hand. You would place the eternal light before my feet and I will not fall nor fail. While I sleep, your angels will sing lullabies and say, ‘Sleep. child. sleep’. What makes Cat’s story unique is her gift. You see, Cat has faith, and it has made all the difference. Faith is her gift, and it will be put to the test to see if it is real, and to strengthen the measure given her for later use. First, the hard part. You must understand the reason’s behind Cat’s wilting, and angry spirit, for she was not always that way. You see, after many years of trying to be a good Christian like her mother and father, trying to live her life in their footsteps from the shadows of all they had done economically and spiritually for Glory Town, Cat shook her arms facing the sky and screamed up at the ears of God, as if He were there. Filled with rejections caused by believing those “good” people of Glory Town who claimed to be God’s children, Cat finally threw in her towel and lived in the singleness of her own mind. Community, sisterly love and congregating with them was, well, truly, out of the question. She vowed to cut every relationship and denounce all spiritual ties with “those idiots” of her scorn. The last accusations against her, had been the final straw. “Calling me ‘a witch’, how dare they!” Cat rebuked their slurs as if God listened anymore. Her scowl said it all; and from then on, she no longer congregated with anyone in Glory Town unless it was absolutely necessary. Cat cried into the brandy snifter. She sat alone reminiscing about people and her vanishing past while lounging on the 19th century velvet olive-green couch in the manor’s library. Holding the brandy snifter in her right hand, she swirled the amber liquid at the bottom of the crystal glass. The movement was hypnotizing. not a young woman’s overactive imagination. She stared at her brandy. There, in the glass, a face appeared again. It was a boy, looking at her from within the mirror of the liquor. He had sandy hair and his skin was fair with sunburned pink cheeks. In less than a second, the boy’s image disappeared. Cat jumped back momentarily, then back again, eying deeper yet into the liquid, trying to see the anomaly. As quickly as she imagined the image she saw, nothing but brandy looked back at her. She looked behind her, thinking the boy would be standing there. How did he get there? “Who is he?” A chill passed through her. The air was thick, and the room smelled of sea water on a hot summer’s day, but it was freezing outside. “I’ve had too much brandy,” she muttered to herself. She thought about that, and set the snifter down for the night on the table beside her. She remained on the couch, thinking. After a while, forgetting the boy’s face, she dismissed the foolish delusion, She flashed back to the beginning of her anger – frustration – rages, regarding these “good, kind” people of Glory Town. Ruminating, her mind ran away from the pain, way back in time. She saw herself – perhaps, she was four or five, maybe; she couldn’t remember. But the time was when she met her best friend, Daniel Davis, who was slightly older than she; and, it was a haunting memory, a mystery she would never forget. Daniel was the minister’s son. From kindergarten until teenage years they were bosom buddies. He was a handsome boy who grew into a gorgeous young man. Always shy around others, young Cat was the one that made him laugh. Daniel trusted her. It was if she had always known him – even before they met. Confidences and secrets were hidden in their hearts. Their families wanted them to marry when they were older. From Cat’s sweet smile anyone could tell she wanted nothing more than this, but, in her heart, she knew it would never happen. With all the hopes surrounding them, she went along with the idea that their marriage event would occur, anyway. She knew that Daniel loved her, but the dark secrets he’d shared when they were teenagers, made such wishes impossible. He loved to cook and garden. He worked around the house and never wanted to go hunting with the men. He had strong shoulders because he chopped wood for the townsfolk. At the high school dances, he performed the latest moves like they were second nature. So, he was popular, too – every girl’s best friend, sweet, kind and intellectual, and mindful of the teachings of the elders. But, he litened to the forbidden radio to hear the latest news about world events and fashion. He snuck away from his father’s hellfire and brimstone messages to learn all he could of the outside world. That which compelled him to quest far beyond the oak-lined alleys of Glory Town, was as second nature to him as dancing. Daniel loved men. Glory Town would never allow him to live there, if they knew. And, he didn’t want to live a lie. Cat loved him unconditionally and would hide his secret forever, but she knew she would never be his wife no matter how hard anyone, and she, wished. It was easy to visualize her entire life with Daniel, but she would have to settle for being his best friend. There would be no romance or physical penetration when two souls meet, embrace and unite as one. She knew this would never happen. It made her sad; she wanted what lovers have; she wanted matrimony – with him. She loved him and adored him more than can fill a heart and mind and soul. But because she loved him so, she was willing to sacrifice that precious union, the whole man and wife magic, that blessed sacrament. He was Daniel; he was hers and she was his; it was just a different kind of wonderful than anyone could know. Daniel revered Cat’s willingness to sacrifice her future for him, honoring his dark secret. But, he couldn’t bear allowing her to live a life with him devoid of physical engagement. He would hold her heart, but there would be no joining of their two spirits. There would be no conjugations; there could be no true marriage. As much as he, too, prayed he could compensate with the purest of love, Daniel could not ask Cat to throw so much of herself away, for him. everyone – her gift of healing animals, her gift of of healing all living creatures. He stood in amazement every time they were together. She could heal people of so many ills, if they would just let her. The blessing of healing she manifested from within her were far too precious not to scream it from the mountaintops. He told everyone. Assuredly, that is how jealousy took root in a family, and then spread like a forest fire in a drought. Because Cat had these gifts, amidst her shining star character and brilliance, she upstaged the pillars of the town, the respected elders and queens of the clans of Glory Town. One family in particular began lambasting Cat at every turn, The Bartons’ three daughters, Priscilla, Patsy and Daphne, were this community’s beauties beyond compare. They also won the majority of scholastic awards – but, of course, their mother, Ruth, taught at their school. Patsy was Cat’s age, and she desperately tried to provoke Cat into any competition that presented itself. But there was one area she had to dismiss. Patsy couldn’t carry a tune in choir practice, and Cat had perfect pitch. But Cat was never allowed a solo. Mrs. Barton made certain of it. The girls’ mother graded Cat on a curve Mozart couldn’t master – all because she thought Daniel would be a better match for Daphne. Every time the Barton women could make a negative slur about Cat, they dug a slanderous ditch for her. Silently, they listened and gritted their teeth at Daniel’s accolades of Cat; they wanted to believe he was delusional. Like sour grapes, they imagined if he married this little insignificant girlfriend, Cat Dubois, he would one day discover that she was just like all the other dreadfully boring women of the town. Surely Daniel was making a mistake! Clearly he was bewitched by this common girl and could not see Priscilla, Patsy or Daphne because of the enchantment with which the little trollop Cat blinded him. Those words changed his life forever – just as he’d thought. Daniel was expunged from Glory Town by his own father and mother. He was given a knapsack of food, water in a thermos, and allowed to keep only the clothes on his back. He traveled on foot up the winding road, making the curve out of town on Downy Park Ridge Road. His younger siblings watched him leave until he was out of sight. They were unsure of the reason why he had to go; their parents and everyone who saw stood silent; but, they all knew something bad had happened. “Mama. Mama, where is Daniel going?”, they pleaded, crying and pulling on her flowered cotton dress. One held onto her dirty apron. Daniel’s home, the day before his announcement, was now a place in his past. One confession changed his world – that first sentence was all it took. It changed his mother’s and father’s lives, and those of his siblings; it changed Cat’s life. The sky became grayer. The light of day dimmed to darkness. The brilliance of some special charm in that town lost its shimmer; no, it was gone altogether. An artist left and took all the colors with him. Enchantment with the hope a new young couple would bring such delightful children to sing in their choir – what was to be a slice of the magical life of Glory Town was erased in an instant – all because Daniel didn’t fit the mold. The pretty picture they had painted in their minds didn’t match God’s unique creation – the young man who had just hiked out of Glory Town. Daniel’s mother stood like a lone tree in the desert. Her husband had scurried their other children inside. She was alone. Was she embarrassed or sad? Perhaps, a little of both but she knew she wanted her Daniel back. Would she ever see him again? Word traveled before Daniel even made the first curve in the road. Some gossiped that his mother was so ashamed she couldn’t even move. Cat later knew that his mother was just broken-hearted. She knew that his mother would never heal; she knew that she, herself, wouldn’t. The sun was blazing hot ‘though it would soon be dark. Sweat began to trickle down his head. Daniel was afraid, but free, at the same time. No longer would he have to live a lie though his immediate thoughts were, “Where will I go? Where will I sleep tonight?” He pressed onward. Finally, going inside to look out the kitchen window, Mrs. Davis strained to see her last glimpse of her son. Her finger tips pressed the window trying to pull herself closer. She wanted to run after him. “If you go after him, then you might as well pack your bags. You better not even think about it.”, Rev. Davis barked. After gruffly preaching this to her, she stayed motionless at the window. He hit the wall beside her, putting a hole in it, then he marched upstairs and slammed the door. The good Reverend never spoke to his wife again, unless he had to. She didn’t care. She hated him for this. She almost hated his God that he preached about on Sundays. to drive him to the next town, her father refused. “Catherine, you go to your room right now!” her father said angrily, his French accent making the words sound so much more foreign. Cat ran to the top of the stairs. There on the table next to the banister, she caught a glimpse of a roll of money – money on top of her mother’s purse. Cat grabbed the cash and ran the rest of the way up to her room. She hurried to the window and looked out, waiting until Daniel walked by. Daniel waved back and blew her a kiss before he scrambled to pick up the money he could in a hurry. He stared back, seeing Cat’s mother looking out the front living room window. She gave a wave, too – a fragile, weak kind of wave. Mrs. Dubois prayed as he turned and walked away. “Oh, Lord, please protect him. Send your angels to comfort him. Keep him safe. Please. Thank you.” Then, she went upstairs. She went straight to Cat, putting her arms around her tightly. Together, they cried. “What will happen to him, Mama?” Cat asked, wiping the tears on her face. “I don’t know, Cat, honey, but we will pray that God will be with him.”, Mrs. Dubois said. “I know. I left it there on purpose. You’ve a great heart, Elizabeth Catherine Dubois. I’m glad you did that for him; it was the least we could do for that sweet young man. I know how much he means to you.” They held each other as they watched Daniel walk up the road until he was no longer visible. “Mama, will I ever see him again?” Cat asked. Cat quietly slipped outside and jumped into the car parked down the drive to the side of the house. Mrs Dubois distracted Mr. Dubois with the suggestion of summer night’s passion, “My, it’s hot tonight. Come upstairs with me. I have something for you. A gift.” She smiled and winked. She curled her index finger to and fro. “Come on. I’ll meet you upstairs.” Mrs. Dubois turned on the bath water for two. The sound of rushing water would distract his hearing. He wouldn’t be able to hear the car’s engine as Cat started it up, nor would the Impala’s headlights reflect in the large victorian bathroom. Her distraction worked, for Mr. Dubois couldn’t get there fast enough. For the moment it seemed as if he forgot about Daniel’s drama and gladly he accepted the invitation. “Turn on some music dear…”, she taunted. “Promise? Swear it.”, she begged. “Okay.” Sniffling, Cat hugs him one more time. “I’ll keep in touch. I swear.” He held the door open as she got into the car. Pulling out of the motel parking lot she found the mountain road that would take her home. Cat thought about him every mile of the way. Through her sobs and tears, she wondered how he would survive. Upon her return, she found that her parents were fast asleep. Cat slipped upstairs toward her bedroom, silently replacing the gifts her mother had lent her. The women thought the father never knew she had taken the car. But, when she pulled back into the driveway, he was listening. He sighed relief, and said his thank you’s to God. A tear formed in his eye. He never let on he knew, and they didn’t ask. Cat wrote in her journal that night, trying to understand the day. Even though her daddy was tough and often cool, he thought the world of Daniel, like the rest of the family. But, after Daniel left that summer, her daddy would hug her, for no reason. He never said anything. He just hugged her. It rained for one whole month in Glory Town. Perhaps the town was secretly crying about Daniels departure, or maybe it was the angels crying. As for Mrs. Davis, the days of her sobbing were over, but she would never smile again. She stared down that road, and waited. She just waited…and waited…and waited. She had a feeling she would never see her boy again, her precious Daniel. She questioned the rules voiced through the insensitive humans who surrounded her. How was it possible that a loving God was so cruel? How could it be that they worshipped an unloving deity that allowed no mercy or grey areas to exist, especially, in Glory Town where things were supposed to be based on God’s love? Black was black; and white was white; and there would never be any shades of grey there. of paint, and children who walked and talked the Holy Scriptures without pleasurable smiles. They sang Christmas carols all year – songs that now meant nothing to her; they were simply empty, dead words—just like her feelings. Cat saw Mrs. Davis’ endless watching to see if her son would walk again down their lane again – day after day, one year to the next. Cat wanted to reach out and touch her, to tell her how she felt. After all, they understood and accepted Daniel exactly as he is. But, Cat stayed her distance; she did not intrude. Cat did pray, however. She asked God to help Daniel’s mother, “We are two women who know painful sadness: for Daniel who took the rainbows with him, for the unicorns also departed with their smiles.” Cat laughed at her silly humor, but she felt like all this about Daniel was just that – ridiculous. Besides, anything that brought a magical feeling did disappear out of their lives when Daniel left. Meanness grew from the seed of uncompassionate judgement and resentment, planted the day they exiled Daniel. That seed grew with more cultivation than ever in their grounds of high expectations. Trying to live up to all the “Thou shalls, and the Thou shall nots” had turned out to be a very hard lesson that kept getting more difficult with every day. If there was any grey area, it was gossiping. Somehow one could gossip without sinning too badly. “After all, who is perfect?”, they justified. The gossip queens found protection under the Almighty’s great wings of grace. Apparently, gossiping was very forgivable, for them. It was letting off the steam from their boiling pot of perfectionisms. They loved to gossip about two things: Cat and Daniel. And, of course, Reverend Davis. Not one of the townspeope ever visited Mrs. Davis – not even once. All the scriptures regarding pain and suffering were, simply, not much comfort. The scriptures were used to convict her son, not to love him. Wasn’t their God supposed to be a God of love? This is what she had always believed. Perhaps, she was wrong about “His” character. A hateful God she would not, she could not, follow. Mrs. Davis desperately wanted to talk with Cat, but her husband’s strict rules – to stay away from the Dubois family – kept her from paying a visit to the manor house. She was so fearful of what others would say; and more afraid of her minister husband. He might hit her. He would definitely berate her, although never publicly. But, she had borne his harsh blames and accusations that she was the reason Daniel grew up to be queer. He growled, rebuking the mother of their child, “Had you not coddled him so often and treated him like a girl, this never would have happened.”, and “God, help you woman!”. Of course, he blamed his wife for all of it: Daniel’s homosexuality; the fact that he wasn’t a real man in his father’s definition, or that of his community; and that he had to leave his home. It was all her fault! And so, Mrs. Davis changed. She avoided the congregation, and she isolated herself in their lonely prison of a home. The only hope for a glimpse of godly mercy would be that Cat Dubois would hear and answer her prayers: that some how Cat would make a way to find her and tell her about her son, her Daniel. “Please, hear me, Cat. Please, come and tell me about my son.”, she prayed repeatedly. Then one day, a diagnosis was confirmed by her doctor. Mrs. Davis was dying. Parasitic cancer was rapidly growing. She called their maid, Ernestine, to send word that she needed to talk with Cat Dubois. she would do it. She had to think quickly. How could she sneak Cat inside the minister’s home where the ill woman waited? Ernestine was resourceful – she went as quickly as she could to consult the other maids of Glory Town on the sad situation. Now, those who worked as domestic housekeepers in the town were all black women, and were forever under the ever-watchful eyes of the influential Glory Town hobnobs; but, when it came to the dying, well, the dying get their last request, no matter what; and the maids knew how to serve those needs best. So, these women used that trust and liberty to work together to pull off the plan. It was an elaborate and grand scheme of orchestration by these Christian women, so prejudicially considered as subservients by most everyone in Glory Town. They would accomplish what no one else, so far, had managed or even tried to do in consideration of Mrs. Davis. These women were going to help Cat Dubois meet with that one woman in Glory Town who desperately needed to see and hear from her. “Knock-knock” on the Dubois’ huge wooden front door was the first stage of their plan. Ernestine sent Grace to visit Cat. Grace was the daughter of Beulah, Ms. Dubois’ cook, when Cat was a baby girl. They had never met, so Cat didn’t recognize Grace when she appeared at the front door; but, once she introduced herself, Cat was all ears. She knew it had to be very important for this woman to call on her out of the blue. First step: Grace drove behind her, so Cat could park her easily-identified Jeep a few blocks away, hidden from prying eyes. From there, Grace picked her up and sped to the Davis’ home, making sure she was just under the speed limit. She dropped Cat off at the back door. Second: While the drive, drop-off, visit, and pick-up was in process, some of the other women in their black congregation were putting finishing touches on pies in different flavors: cherry, blueberry, apple pie and even a chocolate one, taking care to add fresh whipped cream, and brewing freshly ground Columbian coffee, too. While those women were readying the refreshments, a few others were sent scurrying around town, inviting all the ministers they could find, from all the denominations and congregations, for an important, though impromptu, morning chat and prayer breakfast. Along their route, they would even ask some of the local “nosies” who loitered around the church, “volunteering” (mostly, of course, so they could be the first ones to know who had died, who was planning a wedding, who was spending too much time in the preacher’s office). The domestic brigade had to keep them busy, too. All this was planned and executed in less than 24 hours. As soon as Cat got in the back door, she moved quickly to Daniel’s mother’s room. She would have maybe two hours for them to talk – if Daniel’s mother could last that long, not becoming too weak from being anxious, and then the visit with her “guest”. Justine set coffee on the bedside table for Cat. After parking her car down the street, Grace followed Cat, entering the Davis home to make sure all was safe. She graciously backed out of the room, leaving the two secret friends alone. She joined Justine in keeping watch for anyone suspicious, waiting and ready to whisk Cat away and back to her Jeep. They took their positions, Justine was at the front window of the house; Grace stood guard at the back. Other than the postman who was extra friendly with Justine that day, there were no hitches. It was a plan made from heaven, for now. Faintly, Mrs. Davis breathed, “Oh, Catherine, how I’ve longed and prayed for this day. The heartbroken woman could hardly contain her tears. The words were hard enough to say because of the toll of the disease, but the heavy flow of deep weeping, alone, would have stopped her flow of conversation if she had not been determined to talk with Cat Dubois. Her last hope to Daniel, she would muster up the strength to talk and listen. “Tell me everything you know about Daniel. Please.” Her voice quivered, and she tried to look up at Cat. Weak as she was, Mrs. Davis had to hear every word. She called her Catherine. Mrs. Davis had always been more formal than most; she was, after all a preacher’s wife; and she was kind when addressing anyone around town, but this young woman was due some real honoring. At the very least she would call her by her given name. Catherine had en- dured as much pain over her relationship with Daniel as she, his mother, had. She wept as Cat began. “But, first,” Mrs. Davis softly interrupted. “Before you say anything, I want to tell you how much I appreciate you. I wish I had been bolder after Daniel left. I wanted to come to your home. I wanted to, but…” Her voice trailed off, and, as her eyes look down in such despair, she cried harder. Her voice became shrill; her pain was more than even Cat had imagined. “I am ashamed, for not standing up to the bitter, hateful gossiping, and for not standing up to the Reverend. I cannot even refer to him as my husband anymore.”, she said, finally. Glory Town like razor-sharp daggers. Cat was delighted to share everything she knew of Daniel in his mother’s final moments. She continued to hold her hand. In an unusual way, it was like holding Daniel’s hand; it gave her strength. So, Cat held back any sad or frightening thoughts about him. She told his mother how Daniel had become a man. She didn’t tell him he was a drifter or a gypsy. She just spoke of the best of his life. “Most of all, he told me to tell you how much he loves you, and his father.” Cat thought about lying to her. Lying would make it easy for the frail woman to pass on, but, Cat wouldn’t lie. She knew all lies eventually catch up in one’s life, or beyond. She did, however, sugarcoat the good reports. “He forgives me?”, Mrs. Davis asked. Her tremendous sadness was tough for Cat. She stretched over a bit to gently hug the grieving mother. Within minutes, Mrs. Davis closed her eyes and went to sleep. Cat kissed her forehead. It was time to leave; she had been there more than an hour. She slipped out of the bedroom, and Grace hurried her to the Jeep. “Goodbye, Miss Dubois.”, Grace said as she turned to leave. “Thank you for your help. I needed that as much as she did.” Cat gently shut the car door. Even though Glory Town was so small, Grace and Cat’s path likely wouldn’t cross for a long time, if ever. She paused to think how grateful she was for Grace’s safe passage for her, for the courageous and ingenious thinking of all the women who helped. They, too, could be judgmental in their own ways, at times, but they recognized that Mrs. Davis needed closure about Daniel, and they did exactly what their Lord through Ernestine had asked them to do, without a second thought. That evening Daniel’s mother drifted into a coma from which she never awakened. Her funeral was on a bright sunny day. Cat made her way to the church, and sat in the back. She went for Daniel’s sake. She went for the sake of his devoted mother, Mrs. Rebecca Palmer-Davis. She also attended the graveside ceremony, standing a good distance from the others, but not too far from the “colored ladies” as she respectfully thought of them so much moreso than before, and certainly moreso than the other white folks. It was late summer or early fall, and the year was 1980. As it was, Reverend Davis suddenly died of a heart attack less than two months later. Cat knew he died of heartbreak, too, drinking himself into the grave by self-medicating from the pain of it all. Daniel’s leaving, combined with his wife’s sad and painful death, finally overwhelmed him. It was more than he could bear. He was buried on a cold rainy day in the first part of winter. Daniel did not attend either of his parents’ funerals. Had he known of his mother’s illness, he would have jumped over the moon and fought off dragons to be near her in her last days. But, he wouldn’t hear of their deaths until later, when a couple from Glory Town happened to be where he was moonlighting as a bartender in a strip joint three counties away. They came for fun. Just to sin a little. You know, get away from Glory Town. As they sipped their drinks and talked to Daniel as if he was their best friend, and as if nothing had happened, they told him, nonchalantly, that his mother died in late summer and his father, two months later. They drank and laughed their night of escape away from Glory Town, and Daniel pretended to laugh with them. Secretly, inside, he ached. He thought of both of parents. Nothing was settled in this lifetime; nothing was forgiven; nothing was better, but worse, with the news that came as if the drunk couple told him about having a tooth extracted – nothing more. That night, on his flea-ridden cot, Daniel held his gun cocked. Several times, he place the barrel to his head. He didn’t do it. He just fell sound asleep. She answered, “I’m here because someone prayed for you.” The woman spoke with an old English accent. “Who?” He looks at the woman in his dream. She’s wearing an old green velvet dress. The strange dream never left Daniel. And, he did deliver the message to Cat the next time he saw her. Although the dream was vague, and all the time in the world could have passed, he would never forget the old English woman who got him through that night, the old woman dressed in a green velvet dress. A more traumatic blow befell Cat, within a year after Daniel’s mother and father died. A winter more bitter than the last took both her parents. They had been to a neighboring town to pick up supplies to hunker down in preparation for an ice storm headed their way, but the storm was moving fast. home to be at home, safe with their daughter. Like many others before them, her father saw the ice on the curve before the bridge and slowed, but once they hit the suspension, the ice was black as the night and he lost control. They were gone in an instant. Catherine would so sadly become the heir of The Dubois Manor in Glory Town. Daniel traveled back to Glory Town when he heard of the Dubois’ deaths. It was the winter of 1981. He walked to the old manor. There he stayed with Cat for a week. No one knew he’d visited, except perhaps one man – a suspicious watcher – who wasn’t sure it was Daniel, but knew that someone was up there with her; and, being nosey enough, assumed it must have been him. Daniel didn’t attend the double funeral. In fact, he never set foot in the perimeter of Glory Town. The Dubois Manor was as close as he would come. And, the curious watcher didn’t make a big deal out of his assumptions either. Maybe it was just out of respect for Mr. and Mrs. Dubois, because if he had made even one comment, it would have become like a tidal wave in Glory Town. The townspeople had nothing better to do, and gossiping about Cat had been their favorite pastime for years now. She was the mysterious woman who never married, but was still gorgeous, despite the degradation and misery they caused with glaring eyes and whispers. And, she bore unusual healing talents, and the strangest crystal blue eyes. They said her eyes could capture souls, so they faced their fears of her with rumors and jeering laughter and cruel gossiping. This was one of the reasons Cat stayed away from them as much as possible. Cat knew this about herself, that her eyes were like crystals – that she could mesmerize people, sometimes. She used this on occasion – for her eyes could throw invisible daggers of sinister emotion. Once in a while, when things were just too out of hand, when she really needed, she used her visual knives to intimidate the gossip queens. When Daniel arrived at the manor, Cat made a warm cozy bed for him and prepared fine meals. Two more times after her parents’ funeral, Daniel came to stay with her. He became complacent about life – a vagrant; and he eventually moved closer to Glory Town, living on the streets of a nearby town. He had not found his self-worth…yet. The next year, mid-winter, and with shoes so worn he was almost barefooted, he came wandering to Cat’s back door. He didn’t want to be seen, but he would chop wood and stay in the warmth of her kindness. She ministered to his broken heart. He would never stay longer than a week, although she always offered him a home for life, if he so wanted. But Daniel would visit the Manor, and then leave again. Perhaps, it was the sadness of never being able to see his mother or father ever again that was just too painful to be near Glory Town for long. One day, Daniel walked away wearing new shoes, purchased by Cat at the town market. He had a little money in his pocket and refused any further handouts from Cat. But, he always did what he could for her, in return for her generosity. He had pride, after all. He chopped her wood, so she would have plenty for winter. He fixed her barn doors, and the garage door, as well. He painted the trim of the manor’s windows. The weeds were pulled out of the flower beds. On the fifth day, he gathered his few belongings in his leather shoulder bag. Cat watched him pack through the crack in the door of his bedroom. It was time. She knew he was going, just like he said. He fixed everything in five days. She went downstairs and made a fresh pot of coffee. He stood tall at her kitchen threshold, without speaking. love you. There is a whole world outside of this place.” He smiled tenderly. His eyes told her this was the way it was going to be. “No, I stayed here. I owe you.” Daniel handed her the money back. “No, Daniel, this time, I insist. This is for the wood you chopped; for fixing the fences, the barn door, the garage door and the painting. I couldn’t have done this. I know this isn’t enough, but please; it’s all I can afford now.” She wasn’t going to let him walk away this time without making her best effort to pay him. They looked into each other’s eyes. “It’s time,” he said. “The weather is cool and crisp, and the sun is brilliant.” Daniel’s face bore a manly expression. He had grown up. He was a man. He passed the test – the right of passage; he knew what he was doing, Cat didn’t have to worry any longer. Daniel was an honest gypsy. He went from town to town fixing things, staying at farmhouses or in barns in exchange for a bed, food and a bath; and, he was known as far as he could walk for repairing broken fences the right way – the old way, where they last for years even through many harsh winters. Sometimes the fences looked beyond repair, but Daniel could mend or rebuild even those if he was allowed. “No. No one special person.” The sun caught his eye as he had moved into the light from the window. He shewn like an angel – iridescent, glowing with an internal peace. She closed her eyes for a moment, wishing he just wouldn’t go. He took the opportunity to slip the $200.00 on the counter as he opened the door, walked down the steps, and proceeded on the walkway toward the front yard. Cat chased him. “Daniel, please. Please, don’t go.” Softly, she begged. Cat thought he was talking about a man. A man she would, one day, fall in love with. “That doesn’t interest me”, she firmly stated. “Until you send word that you have met your visitor, I love you; I have to go. You are going to be fine.” He turned the corner to the front of the house, and stepped onto the road wearing his new leather shoes. A car was coming and he put his thumb out to hitch a ride. The car stopped for him. Daniel looked one more time at her as he got in, and he waved goodbye. She waved back until the car disappeared around the mountain curve, and the majestic stand of red cedars was all that looked back at her. She wondered if she would ever see him again. “Would he always be a gypsy? Will he be safe? God help him, please.” Cat always kept the night oil burning for him. She hoped he would return. For now, Daniel was gone, once again. Maybe forever. She wiped the tears off her cheeks many times that afternoon. 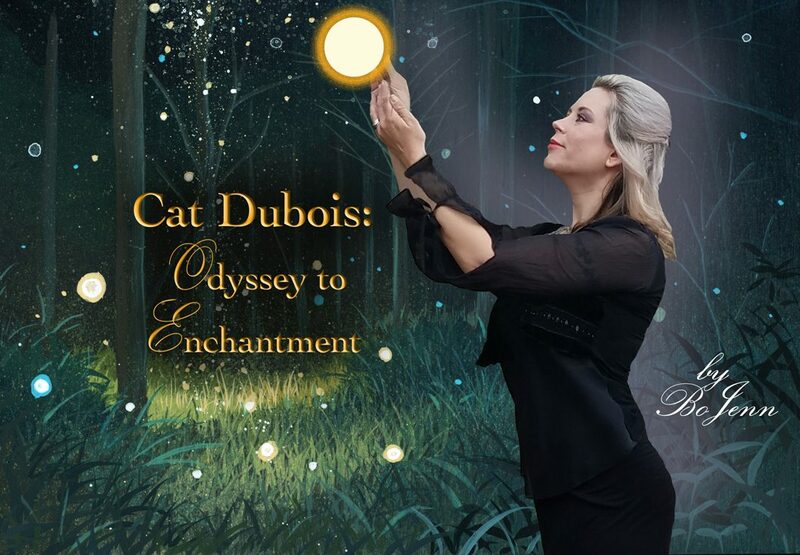 Thank you for reading and I hope you will want to continue on the journeys with Cat Dubois. and, to Jacob, my grandson, who is God’s gift. Manifesting, Supernatural Warfare the Elements of, and things to remember when you battle. One: Keep your eyes set on your purposes. In other words see your desired end result in your mind, heart and creative imagination. Do not waver, even if you become afraid. God expects us to be afraid as this is human. Fear s not a sin in itself, but it is a learning tool used to prepare you to stand before your enemy/crisis. We all have fears though some humans are more anxious and fearful than others and though’s people are “seers.” They see things before it happens. Are they always right? No, but they are sensitive to the outer vibrational forces that might be threatening the surroundings or environment. Their mission is to put their seeing and sensitivity in check so they can achieve the mission. Two: Believe beyond a shadow or doubt. They can not be swayed against their foresight. Without belief “It is impossible to please God.” What ever your dream, vision, desire, heart’s desire one must believe. “You have not because you ask not.” You must ask and believe with a plan otherwise chaos will manifest. Have a plan or course set before God. Three: Before you begin, pray your prayers of protection over you. This should be number one, but you must have a plan before you begin. Pray over your plans and the initiation of the plans. Always be on high alert. Use love and peace that increases the vibration quantum force of your speaking forth of your plan. Anger and fear are strong but you will create better success using love and peace even in front of your enemies. However, there is a time to yell and scream. It’s not a total rule out. Four: Know that you have weapons given to you by God and they are not carnal. These gifts can pull down mighty strongholds. You must believe (number two) and you must know and understand that you are worthy of these gifts. God gave them to you. There are no men “worthy,” don’t you know this? Now, you must believe he gave you the power to become The Sons of God. USE THE GIFT! It’s yours. God said so. Have a splendid day soldiers of the supernatural! In The name of my Lord Yeshua here are reminders he’s taught me.